for registration info, visit CraftU! 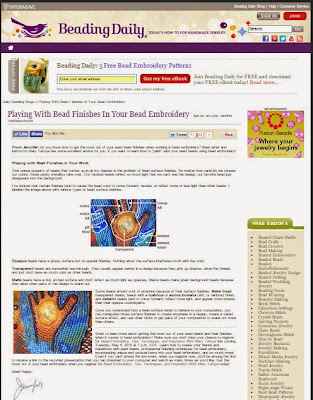 Thanks, Jennifer VanBenschoten, for letting me guest author your Beading Daily blog last week! Everybody who works with "the little glass beads" has to learn (usually the hard way) how to deal with fancy surface finishes in your designs. Reflective finishes, matte finishes, rainbow finishes, see-through beads, yeah they're pretty, but they can sure cause problems! 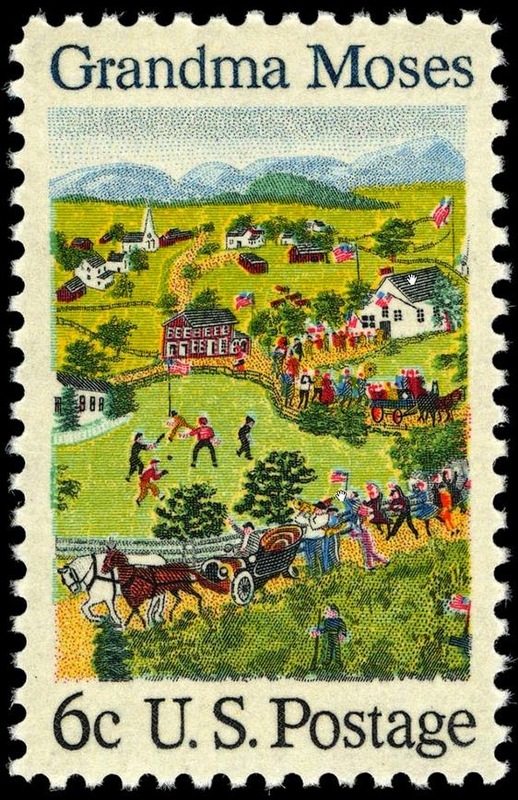 GRANDMA MOSES was an American folk artist who started painting seriously at the age of 78. She had first painted as a child with lemon and grape juice as her pigments! She also created rural and old-timey farm scenes in embroidery before her arthritis made that too difficult. A very hard worker, she worked and lived on farms all of her life. When ask what she would have done had she not become a painter, she gave this reply. Instructions: Notice that the letters beneath the puzzle are jumbled, but stacked in columns. Each letter must go into a blank square, but it can only go into the column above it. Notice that the letter P in the far left column can only go in one place, because there's only one blank square in the column above it. Same with the letter D in the far right column. Here's a clue: Notice that the second word in the first line contains only one (1) letter. In English, only two (2) words could possibly go there: A and I. Look in the column below the word. There is no letter A in the column. There is, however, a letter I available. Put the letter I in the blank square. Now, you have a T, R, E, and another I left to use somewhere in that column. A big thank you to Quilting Daily for plugging my online color theory class! I hope to see some quilters in the first session... amazing color opportunities in quilting. "Take a multi-sensory tour of the fascinating, though sometimes frustrating world or color theory in this instructor-led online course. You'll get comfortable with color terms and concepts, and you'll become an expert at choosing colors for your own work -- in any medium." Starts May 26... tick tock! Online Color Theory Class Gearing Up! Click the image to register, get the supply list, etc. Four weeks of self-paced guided instruction, downloadable color theory worksheets, and lively online discussions. You can ~post your work, ~contact the instructor, ~discuss with your classmates. All you need are 1. internet access, 2. colored pencils, and 3. a printer. This class is a little bit ART and a little bit SCIENCE. You'll learn what you need to know about color theory to solve color problems and make creative color choices in your artwork, on the computer, in your photography, etc. Here we go again! 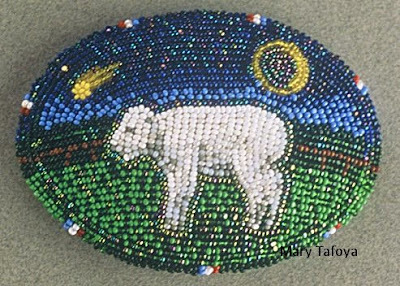 I hope some of you will join me tomorrow midday for another live webinar on bead embroidery tips and techniques. Click to see details and/or register. 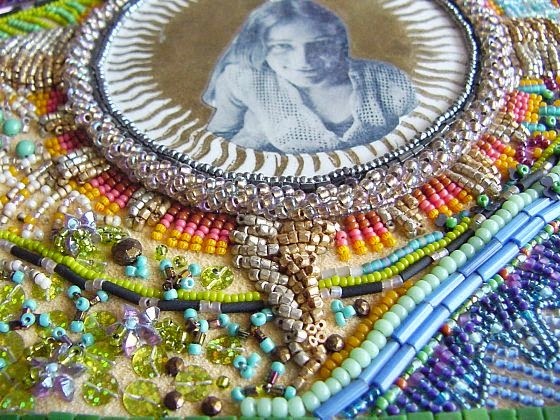 This webinar is about an hour long and it's basically a live slide presentation where I show lots of closeups of my work and talk about various techniques for blending colors, working with mixed media and found objects, constructing a bead embroidery "sandwich" and more. If you can't attend the live session, don't worry -- the video recording will be available for download after the webinar, from the same link above. BUT the advantage to coming to the seminar is you get to ask questions. So if you have problems with bead embroidery, come on by. All questions will be answered during the seminar or, if we run out of time, in an email follow-up!